Taiwan’s tourism hotspots are finally getting the recognition they deserve. Taroko Gorge…Sun Moon Lake…Yilan. Wait a minute. Yilan? 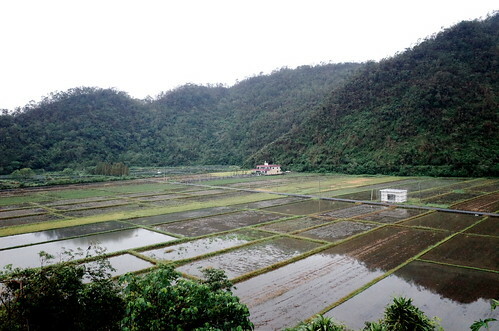 The county next to Taipei through which you snooze on the train from Taipei to Hualien? Surely you jest, Mr. Brown. No, dear readers, I kid you not. Yilan is magic, and unlike the first two mentioned Taiwan travel hot spots, Yilan is off the tourist map. Most of it, anyway, except for Jiaoxi, A.K.A. the only place in Yilan that most westerners in Taiwan know about. Jiaoxi’s been on the tourist map since Japanese was Formosa’s lingua franca. Famous for its healing waters, Jiaoxi isn’t just trammeled, it’s downright overbuilt. But hardly without reason. After all, where else can you soak your feet in hot mineral water while waiting for your train? And where else will you find a place like , a semi-enclosed hot spring hotel featuring a fully equipped aquatic massage-pool, a nautical jungle gym, and a three story high hot spring fed waterslide? So despite the crowds (which are still mild compared to other tourist spots in Taiwan), Jiaoxi is a good place to start your Yilan explorations. And thanks to the soothing hot-springs, it’s a great place to end, especially if your explorations are of the high exertion type. But there is more than just hot springs in Yilan. It also has cold springs. Though mid-winter isn’t the ideal time to visit the famed cold springs of Suao, summer is the dominant season in our little Tropical-of-Cancer paradise. The springs of Suao – and others in the county – bubble up from underground aquifers and are a great place to cool off after a lengthy hike or a bicycle ride. Joshua Samuel Brown is the author of Vignettes of Taiwan and 13 Lonely Planet Guides, including the 2007 & 2010 editions of Lonely Planet Taiwan. He currently leads bicycle tours around Taiwan for Bicycle Adventures, and considers himself a semi-honorary honorary Canadian by virtue of having once lived in Newfoundland. Follow him on twitter @josambro, and buy his most recent book of short stories, How Not To Avoid Jet Lag and other tales of travel madness at Smashwords or Amazon.